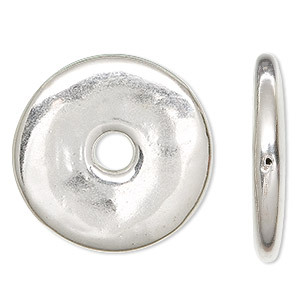 Component, JBB Findings, sterling silver, electroformed, 29mm round donut. Sold individually. Electroformed sterling silver donut is created through an intricate process that begins with a design made of wax. The wax design is then immersed in a solution that electrically forms pure silver over it. The next step burns out the wax, leaving a hollow, sterling silver formation. The sterling silver is then highly polished. The result is an incredibly lightweight sterling silver donut.